Paul Barnes was born and raised on the island of Hawai‘i and graduated from Hilo High School. In 2009 he began his academic journey at the University of Hawai‘i, Hawai‘i Community College, earning his associate degree in Liberal Arts. He is currently attending the University of Hawai‘i at Hilo and working towards his B.S. in Computer Science. 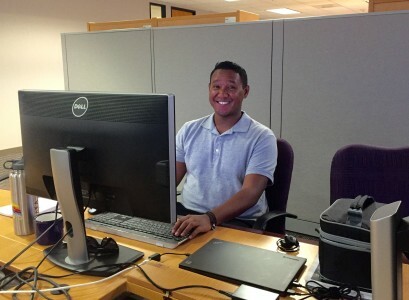 After obtaining his bachelor’s degree, Paul intends to continue his education and pursue a doctorate’s degree in Computer or Software Engineering. In his free time, Paul enjoys going swimming, working out, going on random adventures around the island of Hawai‘i, and spending time with family and friends. Thirty Meter Telescope (TMT) does not currently utilize any software that automates workflow, which is a sequence of operations that are declared as the work of a person or a group. Different systems and subsystems within TMT rely on the workflow process for the revision, approval and publishing of a work product. TMT currently uses Xerox® DocuShare (DCC) as an Enterprise Content Management System (ECMS). DCC has a workflow management option, but this feature has not been deployed at TMT. Switching over from performing Configuration Management tasks, which are the identification, storage, change control, approval, and status reporting of selected work products during the life of a system, manually to automatically using software will increase TMT’s efficiency. The purpose of this project was to assist TMT in increasing overall efficiency by automating the workflow management system. A publication of standards was used to form a basis of comparison to four software packages: DCC, Atlassian JIRA, Advantys WorkflowGen, and Cuteflow. The software’s documentation were used to examine and gauge functionality. The trade study confirmed that three of the four tested software options fulfill the basic needs of TMT: the existing DCC, JIRA, and WorkflowGen. Although JIRA and WorkflowGen outperformed the existing DCC in the trade study, it is recommended that DCC’s workflow should be implemented due to user familiarity of the existing DCC, the inertia required to transition to a new software package, and DCC’s capability for upgrades. Since DCC is TMT’s primary ECMS it should be further developed to accommodate all special needs that TMT may come across in the future.